Map created by STS-133 NASA Tweetup attendee, Nate Bergey (@Natronics), showing just how close tweeps get to view launch from — just 3.1 miles away from pad 39A! A fresh group of 150 NASA Tweetup participants is about to descend on the Space Coast for the final flight of Space Shuttle Endeavour on the STS-134 mission to the International Space Station. Endeavour is set to launch April 19 at 7:48 p.m. EDT. With just two Space Shuttle flights remaining, including STS-134, it is more important than ever that space advocates and NASA Tweetup participants share their unique experiences with the world. NASA Tweetup Tips by @robpegoraro (STS-134 alumnus) — brand new insights & information to help STS-135 participants plan. Tips for #nasatweetup Participants by @lonseidman (STS-133 alumnus) — provides useful insight for communicating your NASA Tweetup experience beyond Twitter, to mainstream media and local audiences via public speaking. NASA Tweetup Prep Guide by @brenthaeseker (STS-132 alumnus) — Terrific step-by-step guide for NASA Tweetup attendees coming to Kennedy Space Center for a launch tweetup. NASATweetup for Newbies by @penguintrax (STS-132 alumnus) — provides helpful tips to minimize hassle and discomfort at the press site. Information & resources for people heading to NASA Tweetup by @SpaceKate (STS-133 alumnus) — serves as a news and information site of interest to future and past NASA Tweetup attendees. Blogs, photos & media reports for the first launch NASA Tweetup by @ageekmom (that’s me, STS-129 alumnus) — provides an overview of the sights, sounds, experiences and the impact of attending a launch NASA Tweetup. Space Shuttle Launch Viewing by LaunchPhotography.com — This is the definitive guide to viewing and photographing Space Shuttle launches, useful to NASA Tweetup participants as well as non-tweetup attendees seeking the best launch viewing location. How to View & Photograph a Space Shuttle Launch by @JeffOstroff — Another superb guide to Shuttle launch photography. Shuttle Launch Photography by PhotoTrek.org — More Shuttle launch photography tips, for those of you who will be shooting the launch. 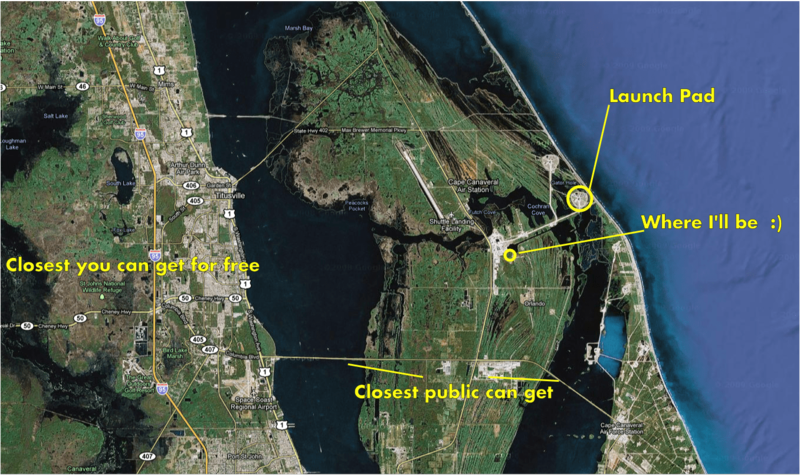 Where to Watch the Launch by the Orlando Sentinel — Google map of free Shuttle launch viewing locations. This is useful for non-tweetup attendees, as well as NASA Tweetup participants whose family members may be traveling with them, since guests are not permitted. Best Space Science Apps by @ageekmom (me again) — Since most NASA Tweetup attendees are equipped with a smartphone, check out our list of space apps for iOS devices, or check out Spacevidcast.com‘s mobile applications list for other platforms. Definitive Tweetup Attendee Gear List — crowd-sourced list of items you may want to bring to a tweetup event. For STS-134 Tweeps who are looking to join the group housing (on average slightly more affordable and remotely possibly more available, though certainly more fun), @mikeyarbrough and @geneshiau might–*might*–be able to help. Last count there are already 4 housing sites and probably a 5th coming online.